The last few years of drought came at a pivotal time for Doug Parker. Just before the dry spell began, Parker was named director of the UC California Institute for Water Resources, which was established by UC Agriculture and Natural Resources in 2011. In this role, Parker coordinates water-related research, extension and education efforts across the 10 UC campuses, the UC ANR system and other academic institutions in California. The timing of Parker's appointment positioned the institute to aggregate and disseminate critical information from the UC system to policymakers and the public about the California drought. 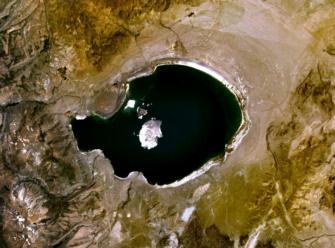 Lake bed sedimentments at Mono Lake, above, and other lakes show that California regularly suffers drought cycles. Parker turned the focus of the California Water Resources Institute to the drought in the summer of 2013, after the state suffered the second dry winter in a row. “We wondered, if it doesn’t rain this year, what are we going to do?” he said. When 2013 ended with almost no precipitation, concern about the drought was building rapidly and the California Institute for Water Resources began taking action. "I sense that our role is to provide policymakers with the best science available to manage our water resources in ways that maximize the public benefit in California." “In January 2014, when Gov. Brown declared a drought state of emergency in California, we had already developed our website with information on what UC was doing to respond to the drought. We were able to aggregate drought information from all 10 UC campuses,” Parker said. When the current drought ends, it will not signal the end of the water institutes’ involvement in the matter. Scientists know by studying lake bed sediments and tree rings that droughts of varying degrees have stricken California over hundreds of years. Climate change portends more dry weather in the future. The water institute will continue to help agricultural and urban communities put water to its best available uses. Conservation and water use efficiency are vital to this effort. Parker said the institute will work on all issues related to water, including groundwater quality and quantity. It will offer educational and training programs related to nitrogen management in agriculture. 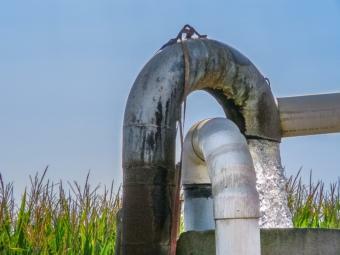 "We need to make sure that clean groundwater is available to supply drinking water to communities and that groundwater supplies for agricultural uses are not compromised by salts or other contaminants," Parker said. Parker also sees a need for increased effort to help communities sustainably manage their groundwater resources. “I sense that our role is to provide policymakers with the best science available to manage our water resources in ways that maximize the public benefit in California,” Parker said. Parker is a native Californian who was educated in the UC system. He earned his bachelor’s degree at UC Santa Barbara in economics and environmental studies and a doctorate degree at UC Berkeley in agricultural and resource economics. His dissertation centered on the relationship between tree fruit quality and profitability in California. After completing his education, Parker took a visiting professor position at the University of Maryland in College Park. He worked on biotechnology in agriculture for two years and nutrient management and water quality for a year before returning to California to serve as a UC Cooperative Extension specialist based at UC Berkeley. Kesterson was impacted by drainage water from farms on the west side of the San Joaquin Valley. Selenium in the water became concentrated in the reservoir, and was found to cause conditions inhospitable to wildlife species. In 1997, Parker went back to the University of Maryland as a professor and Cooperative Extension specialist. He worked on Chesapeake Bay water issues from 1997 to 2011, and took responsibility for regional water management with USDA and other national partners on priority water issues. He led the USDA’s Mid-Atlantic Regional Water Program, which integrated the scientific expertise of nine mid-Atlantic universities, including the University of Maryland, University of Delaware, Pennsylvania State University and Virginia Tech in support of water quality restoration efforts. “In Maryland . . . if it didn’t rain for two weeks, they started calling it a drought." The creation of the California Institute for Water Resources at the University of California in 2011 offered Parker the opportunity to return to his home state and use the skills he developed in Maryland to address California’s critical water concerns. “In Maryland, I didn’t work on water quantity. There, if it didn’t rain for two weeks, they started calling it a drought,” Parker said. The institute will work with communities to understand the implications of the Sustainable Groundwater Management Act of 2014.